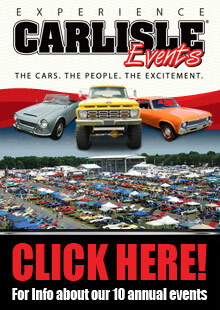 Carlisle Chrysler Nationals (July 8-10) is a true Mopar-lover's paradise. There's nothing quite like it anywhere in the world with over 2,100 vehicles from all eras of the Chrysler brand: classics, muscle cars, high-performance new models and more. You need to be here for: the enormous showfield - organized by year, make and model; indoor displays; kids? activities; industry guests; car and engine giveaways; and NHRA drag racing. Interested in parts buying? Look no further! You'll be amazed at the size of the swap meet, the variety of vendors, the car corral, and the Manufacturers Midway. Whether you prefer the A, B or E body style, this show has it all! Now here's a show my son's would love seeing. They just love those muscle cars. Thanks for reminding us about the Carlisle Chrysler Nationals in July.